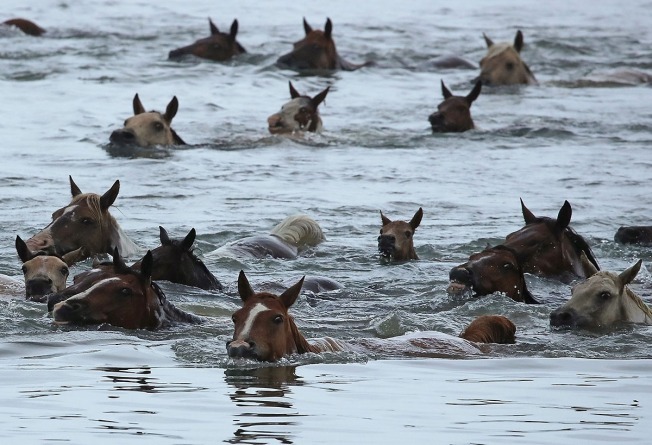 The animal rights group PETA wants the annual Chincoteague Pony Swim to end after one of the ponies died at the Virginia carnival grounds. PETA has asked the Chincoteague Volunteer Fire Company to cancel the annual event and auction, with associate director Ashley Byrne calling it "animal abuse." The fire company says last week's swim was unrelated to the pony's death, which fire company spokeswoman Denise Bowden called a "freak accident.'' Officials say another pony named Riptide was chasing Butterfly Kisses in the pen at the carnival grounds. As Butterfly Kisses ran, she slipped and fell and slid into a fence, breaking her neck. She was euthanized.